This To-Do List is for the 2018 Basic December Itinerary. For To-Do-Lists for other itineraries, see this. 1. Confirm your budget, planned dates, intended hotel, kids’ development and heights, and your transportation choice and its availability for your planned dates. 2. Make your plane reservations, if flying. Make any other needed transportation arrangements. 4. Set up your hotel and tickets. 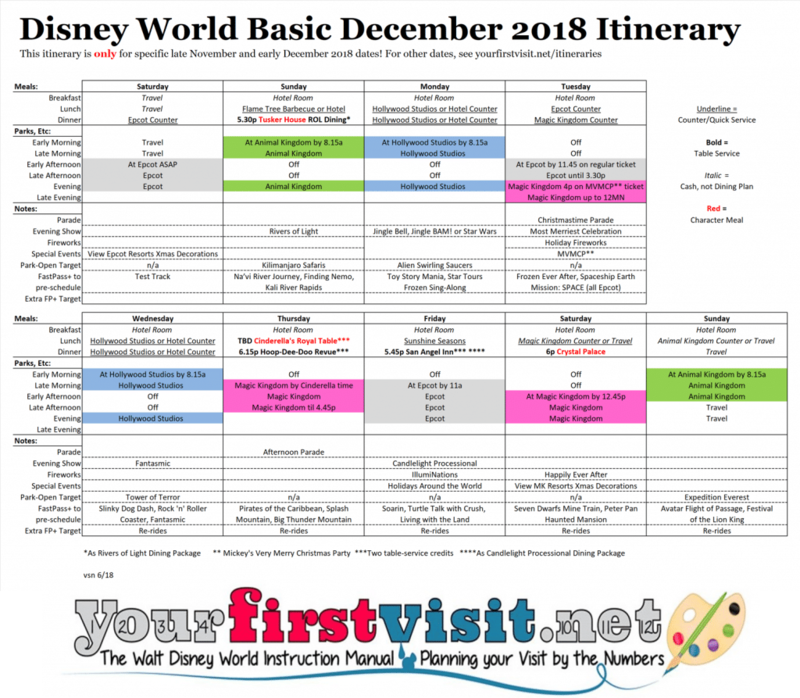 Call 407-939-7675 (preferred, because this allows you to tell the reservationist which building at your resort you wish to be in), or click here to use Disney’s online system. You also want to order your MVMCP tickets for your planned date there. 1. Login to your MyDisneyExperience.com account, click the “Things to Do” tab at top right, under Dining hit “Make Reservations,” and practice trying to reserve restaurants (hint: use the search box at the upper right). This may well drive you crazy, but the site works better than it used to…and is likely the only way you can get your Cindy reservations done! (as the site opens up a new reservable day at 6a, whereas the phone reservation line opens at 7a). 2. Collect your planned restaurant reservations together. You will want to do them online in order of hardest to reserve first. This is how they are listed below. Note that the two dining packages–Rivers of Light and Candlelight Processional–may not go on sale until later in the summer. (For an 180 day calendar, see this). 1. Be on the restaurant website by at least 5:50am EST, and have your Cindy reservation all set up on the page. Keep refreshing, as you will be let in as soon as Disney’s system decides it is 6a. Tusker House as Rivers of Light Dining Package (dining plan, one credit). First Sunday 5.30p. You can schedule for as late as Disney will allow you to do so, but not earlier. 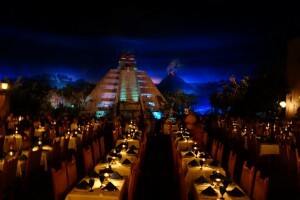 San Angel Inn as Candlelight Processional Dining Package (dining plan, two credits): Friday 5.45p. Can be earlier but not later. Monday at Disney’s Hollywood Studios: Tier One: Toy Story Midway Mania. Tier Two: Star Tours and Frozen Sing-Along. Set Toy Story Midway Mania for 9a-10a, Star Tours for 11a-noon 3.30p, and the Frozen Sing Along for the 10.30a show. Second Sunday at the Animal Kingdom: Avatar: Flight of Passage and Festival of the Lion King. Set Flight of Passage for 9.30 to 10.30a, and Festival of the Lion King for 10.30-10.45a for the 11a show. 2. If you use Disney’s Magical Express, you do not need to collect your bags at the Orlando airport unless you arrive late in the evening/at night or are an international traveler. Disney will get them for you and, eventually, deliver them directly to your room. Your bags may arrive hours after you do; so, depending on the weather forecasts, have a carry-on with an appropriate change of clothes for Orlando weather on Saturday, as you will almost certainly go to Epcot on Saturday before your checked bags arrive. 3. Follow the instructions in the Magical Express packet you will receive in the mail regarding both tagging your bags pre-departure, and where to go at the Orlando airport to find your transport to your resort. 4. Bring a copy of your room reservation, confirmation numbers and any tickets for special events you may have received in the mail. 6. When you arrive at the hotel, look for the special “On-line Check-in” line, and get into it. 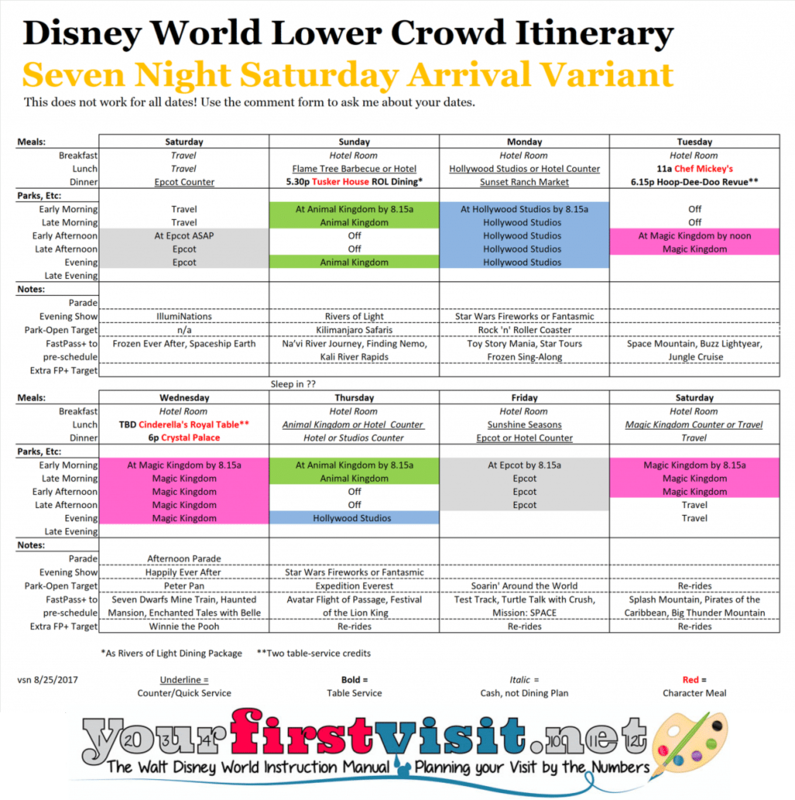 This To-Do List is for the Seven Night Saturday arrival variant of the Disney World Lower Crowd Itinerary. For To-Do-Lists for other itineraries, see this. 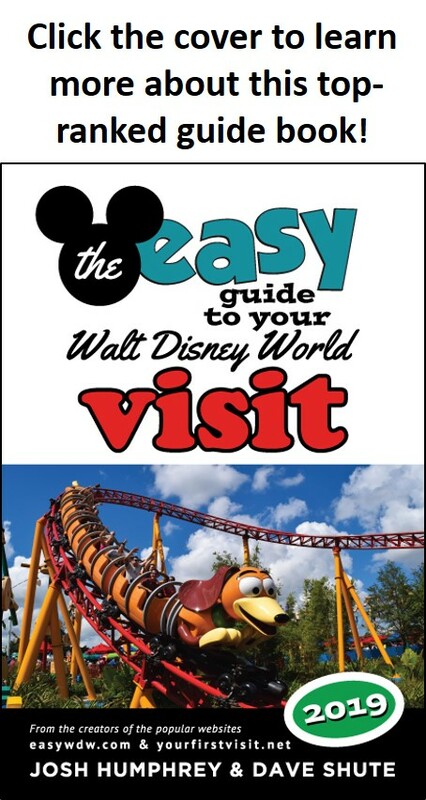 For visits when your Studios days are between June 30 and and August 25, use the updated FastPass+ instructions and touring plans for the Studios day you will find on this page. Login to your MyDisneyExperience.com account, click the “Things to Do” tab at top right, under Dining hit “Make Reservations,” and practice trying to reserve restaurants (hint: use the search box at the upper right). Collect your restaurant reservations together. You will want to do them online in order of hardest to reserve first. This is how they are listed below. Be on the restaurant website by at least 5:50am EST, and have your Cindy reservation all set up on the page. Keep refreshing, as you will be let in as soon as Disney’s system decides it is 6a. Tusker House as Rivers of Light Dining Package (dining plan, one credit). Sunday 5.30p. You can schedule for as late as Disney will allow you to do so, but not earlier. Thursday at the Animal Kingdom: Avatar: Flight of Passage and Festival of the Lion King. Set Flight of Passage for 9.30 to 10.30a, and Festival of the Lion King for 10.30-10.45a for the 11a show. Friday at Epcot: Tier One: Test Track. Tier Two: Mission: SPACE and Turtle Talk with Crush. Set Mission: SPACE for 9a-10a, Test Track for 10a-11a, and Turtle Talk with Crush for 12.30p to 1.30p. Saturday at the Magic Kingdom: Splash Mountain, Pirates of the Caribbean, and Big Thunder Mountain. Set Big Thunder for 9-10a, Pirates for 10-11a, and Splash for 11a-noon. 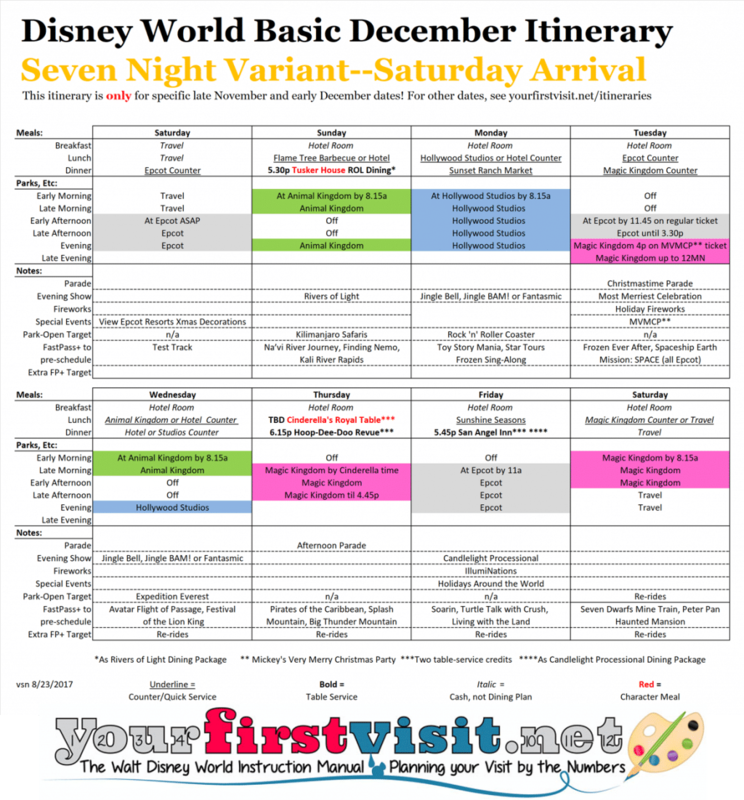 This To-Do List is for the the Seven Night Saturday Arrival Version of the 2017 Basic December Itinerary. For To-Do Lists for other Itineraries, see this. You also want to order your MVMCP tickets for your planned date there. These may not be on sale until later May or even later. Wednesday at the Animal Kingdom: Avatar: Flight of Passage and Festival of the Lion King. Set Flight of Passage for 9.30 to 10.30a, and Festival of the Lion King for 10.30-10.45a for the 11a show. 2. If you use Disney’s Magical Express, you do not need to collect your bags at the Orlando airport unless you arrive late in the evening/at night or are an international traveler. Disney will get them for you and, eventually, deliver them directly to your room. Your bags may arrive hours after you do; so, depending on the weather forecasts, have a carry-on with an appropriate change of clothes for Orlando weather on Sunday, as you will almost certainly go to Epcot on Saturday before your checked bags arrive. 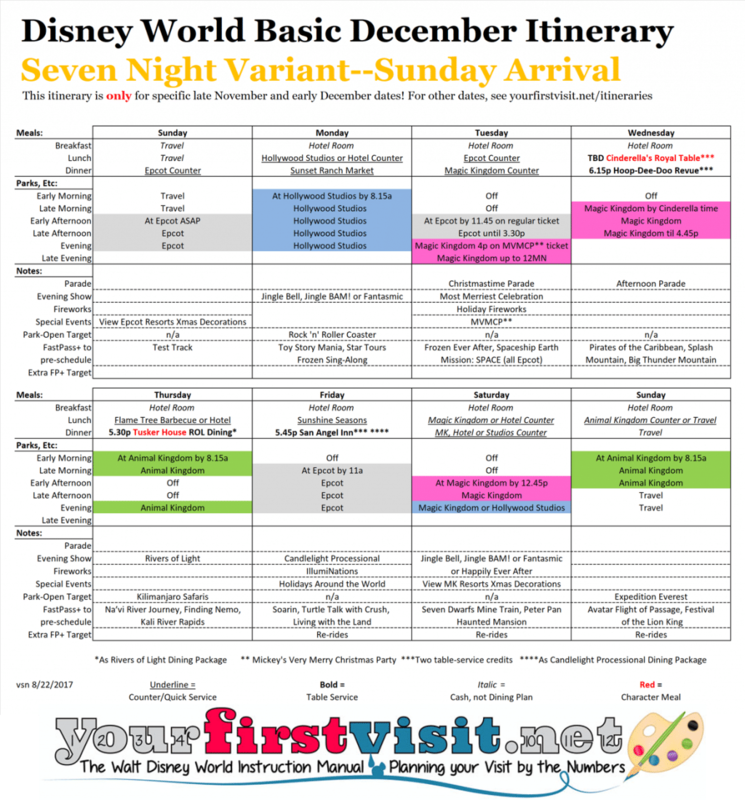 This To-Do List is for the the Seven Night Sunday Arrival Version of the 2017 Basic December Itinerary. For To-Do Lists for other Itineraries, see this. Tusker House as Rivers of Light Dining Package (dining plan, one credit). Thursday 5.30p. You can schedule for as late as Disney will allow you to do so, but not earlier. Wednesday at Magic Kingdom: Book FastPass+ for Pirates of the Caribbean, Splash Mountain, and Big Thunder Mountain. Design the times for them around the time of your reservation for Cinderella’s Royal Table, and the time of the afternoon parade your visit–2p in 2017, 3p in 2018. Don’t set one for 1.30-2.30p for a 2p parade or 2.30-3.30p for a 3p parade, as you will need that time for the afternoon parade. 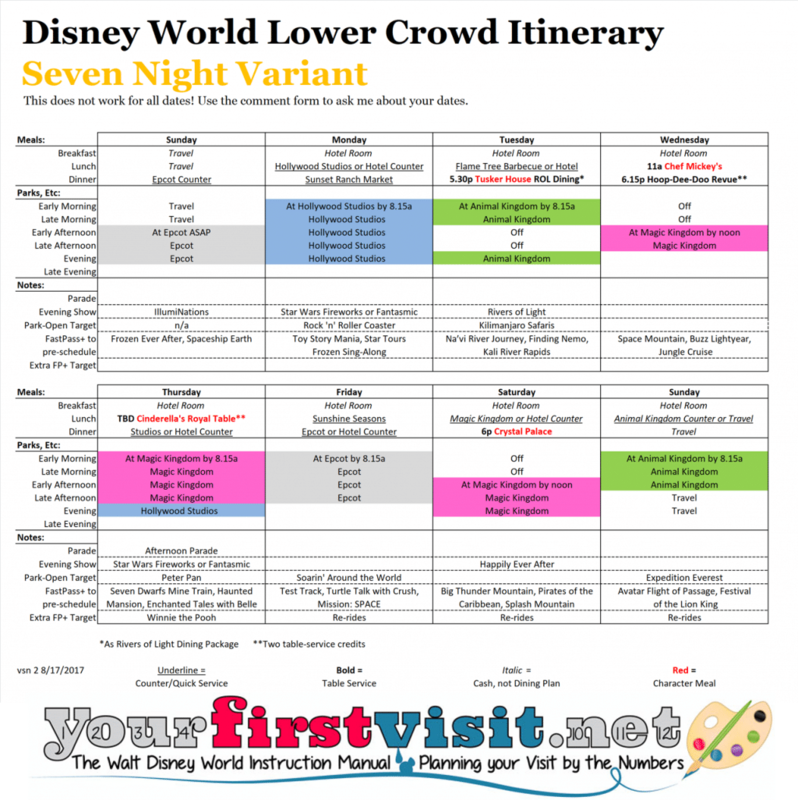 This To-Do List is for the Seven Night variant of the Disney World Lower Crowd Itinerary. For To-Do-Lists for other itineraries, see this. Tusker House as Rivers of Light Dining Package (dining plan, one credit). Tuesday 5.30p. You can schedule for as late as Disney will allow you to do so, but not earlier. Thursday at the Magic Kingdom: Seven Dwarfs Mine Train, Enchanted Tales with Belle, and the Haunted Mansion. Target Seven Dwarfs for 1-2p, Belle for 2.30-3.30p, and the Haunted Mansion for 3.30-4.30p. Saturday at the Magic Kingdom: Splash Mountain, Pirates of the Caribbean, and Big Thunder Mountain. Set Big Thunder for 11.30-12.30, Pirates for 12.30-1.30, and Splash for 1.30-2.30. 2. If you use Disney’s Magical Express, you do not need to collect your bags at the Orlando airport unless you arrive late in the evening/at night or are an international traveler. 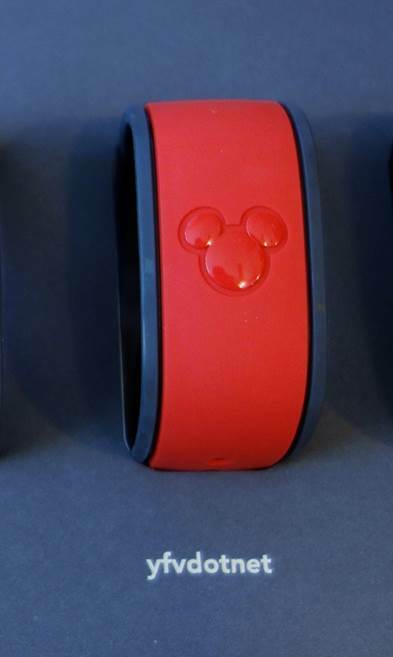 Disney will get them for you and, eventually, deliver them directly to your room. Your bags may arrive hours after you do; so, depending on the weather forecasts, have a carry-on with an appropriate change of clothes for Orlando weather on Saturday, as you will almost certainly go to Epcot on Sunday before your checked bags arrive. 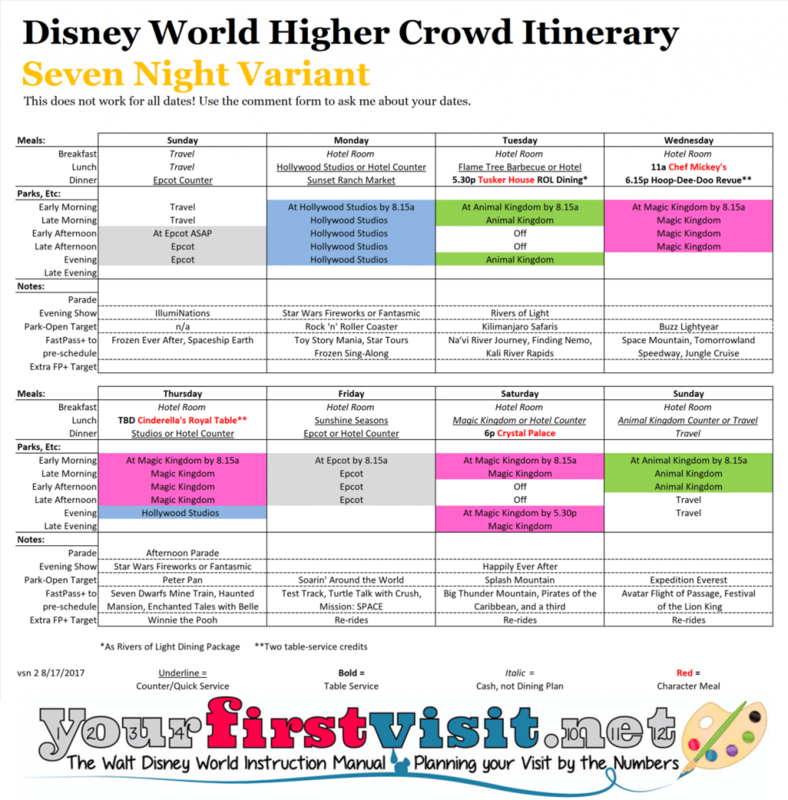 This To-Do List is for the Seven Night variant of the Disney World Higher Crowd Itinerary. For To-Do-Lists for other itineraries, see this. Wednesday at the Magic Kingdom: Space Mountain, Tomorrowland Speedway, and Jungle Cruise. Set Space Mountain for 9-10a, the Speedway for 10-11a, and Jungle Cruise for 3-4p.